In our case the patient had symptoms of signs of amyloid, including orthostatic hypotension, peripheral neuropathy, nose bleeds and heart failure. Amyloid is a a disorder of abnormal protein folding, which aggregate to form beta pleated sheets which wind together forming insoluble fibrils. Amyloid occurs when there is sustained high concentration of normal proteins (e.g. inflammatory states, dialysis), normal concentration of highly amyloidogenic protein over long period of time (e.g. Alzheimer’s disease) or abnormal protein production (i.e. monoclonal light chains). All monoclonal light chains are structurally different and thus they are only occasionally amyloidogenic. Lambda light chains cause AL amyloidosis more so than kappa light chains. Amyloid may be diagnosed by finding a monoclonal protein or abnormal serum free light chain ratio and then linking symptomatology with the disorder. Alternatively it may be diagnosed following biopsy of a target organ. It is important to differentiate between amyloidosis due to monoclonal light chains (AL amyloidosis) from other causes e.g. AA amyloidosis due to chronic inflammation, B2MG amyloidosis (renal failure) or inherited transthyretin amyloidosis. There are numerous types, but the most common being AL amyloid. When amyloid is suspected it is important to confirm the presence of amyloid histologically – usually by the finding of apple green birefringence under polarised light microscopy using the congo red stain. This can be demonstrated on biospy of affected tissue e.g. kidney, bone marrow, liver. Fat pad and rectal biopsies are also occasionally used. Fat pad biopsies have a sensitivity of 50-80%. The second step in the diagnosis is to confirm the type of amyloid. As paraproteins are commonplace, especially in elderly patients, this is not sufficient to diagnose AL amyloidosis. Immunohistochemistry, genetic testing and pattern of involvement can help differentiate. 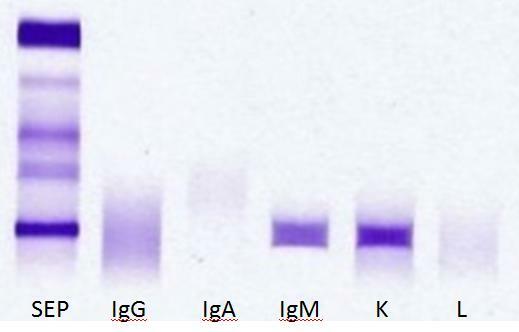 Urinalysis – proteinuria/light chain on electrophoresis. FBC – anaemia – often mild, thrombocytopenia. Clotting – there is abnormal clotting in 50% of cases – raised INR, factor X deficiency. Inflammatory markers – raised ESR, normal CRP. Echocardiography – ventricular thickening with reduced ventricle size. The treatment of AL amyloid should ideally be delivered in the context of a clinical trial given its rarity. Anti-myeloma treatments are used in the management of myeloma. First line is generally the proteosome inhibitor bortezomib in combination with cyclophosphamide and steroid. Thalidomide also has activity in amyloid, along with other related agents e.g. lenalidomide and pomalidomide. In younger patients high dose melphalan chemotherapy should be considered followed by autologous stem cell transplantation. Our case was an elderly patient with evidence of severe end organ damage including autonomic neuropathy and cardiac failure along with elevated NT-proBNP and cardiac troponins. Following discussion with the patient it was decided that palliative, best supportive care was the most appropriate option and she died two months later at home. This entry was posted in Laboratory morphology, Myeloma/paraproteins and tagged amyloid, immunofixation, Paraprotein. Bookmark the permalink.